Have you ever noticed the soft pink and soft orange spring trees? Some spring leaves have soft colors along with the expected green. 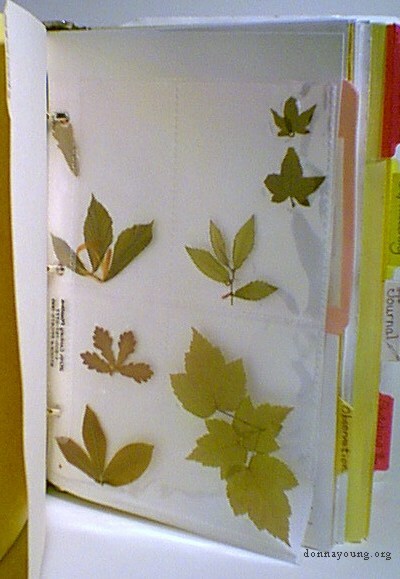 This specimen page holds a small collection of tiny leaves that were gathered in the spring during the 1990's shortly after the leaves emerged. The specimen page is made from a photo aIbumn page and I noticed that the photo sleeves had melted seams, so I decided to melt places in the sleeves around the leaves to keep them in place. I warmed the tip of an old spoon on a stove eye (which was on a med-low to low temp). Getting the right temperature was hit and miss. I pressed the hot spoon onto the photo sleeve in a few places around the leaves. This keeps the leaves from slipping down. If you try this, do not heat the spoon too hot. Too much heat will ruin the sleeve! If you use a heated spoon tip or fork prong to melt places around the leaves, please be careful. A friend tried this and burned her hand and was not successful. The particular photo album page that is used here is from their Century-Poly Classic Size Photo Pages and is the CK-PP100-530PK Century-Poly Page, which holds 8-4 1/4" x 5 1/4" wallet sized photos or hobby cards. I cut the archival page as shown in the little image above.